Here is the great Platte Valley, Highway to the West. On these nearby bluffs prehistoric Indians built their homes. The Pawnee and Oto established large earthlodge villages near here. As you travel west in the valley you will follow the route of the Indians, white explorers, and the early trails to the western United States. In 1820, an exploring party under Major Stephen Long followed the Platte Valley to the Rocky Mountains, as did an 1826 expedition under General William Ashley. By 1830, the valley had become the major supply route for fur traders in the Rocky Mountains. Beginning in 1847, the Mormons on their way to Utah followed a trail along the north side of the Platte. The Oregon Trail reached the Platte 150 miles west of here and followed the south side of the river. By the late 1850's, it was estimated that 90% of all traffic which crossed the Plains followed the Platte. The famous Pony Express followed the Platte Valley, as did the first transcontinental telegraph line. By 1869, the first transcontinental railroad was completed and it, too, followed the valley, opening the land along the river for permanent settlement. 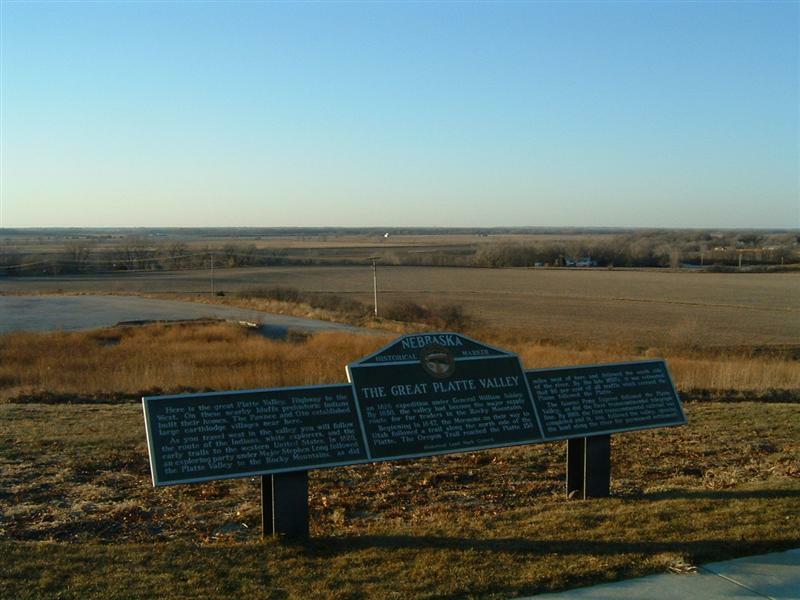 “The Great Platte Valley,” Explore Nebraska History, accessed April 19, 2019, https://mynehistory.com/items/show/446.